Check out this list of 15 everyday uses for hydrogen peroxideyou didn’t know – number 2 is one of the biggest surprises. 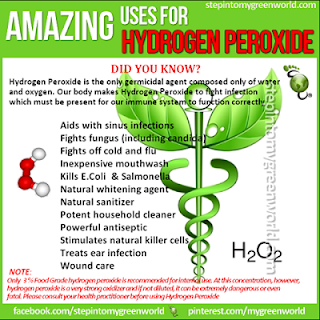 Hydrogen peroxide gently sanitizes cuts and scrapes without harsh chemicals. It’s a natural anti-septic that helps toprevent infection. This solution should be used to help clean minor wounds but should not be used for long term treatment or to clean serious wounds. I always turn to hydrogen peroxide in my home because it is an effective and safe cleaning product. It has strongdisinfectantproperties and so it can be used in the kitchen, bathroom and even on your children’s toys. It’s also great for cleaning mirrors and windows. Simply fill half of your sink with warm water and add 1⁄4 cup of food-grade, 3% hydrogen peroxide, then let your fruits and vegetables soak for 10-15 minutes. I would recommend using this method on fruits and vegetables with thicker skins such ascucumbers and potatoes.